Autofill is a feature that automatically copies the values from another closest feature depending on the current location of mobile device. It is useful when it is necessary to collect a new data based on previously collected data attributes. When a field collector approaches to an already collected point, autofill can populate a new attribute data with already collected attributes. The data collector will see the value in the form after they click Autofill even before they send a submission. Autofill option works both in GPS and Pinpoint mode. Autofill can be set only to text fields and in online mode. In Mobile Data Collection Portal it is possible to set Autofill to fetch attribute data from the layer where the data is collected. Login to Mobile Data Collection Portal and open the project. Add or select a text field. When the changes are saved, open the project in MDC on your mobile device. Note: Autofill works only if there is already collected data in the project. Example: we’ve collected data about assets and want to collect new data, but use previously collected surveyor’s name. Create a project and add a text field. In this example it will be “surveyor”. Open the project in Moblie Data Collection app on your mobile device. 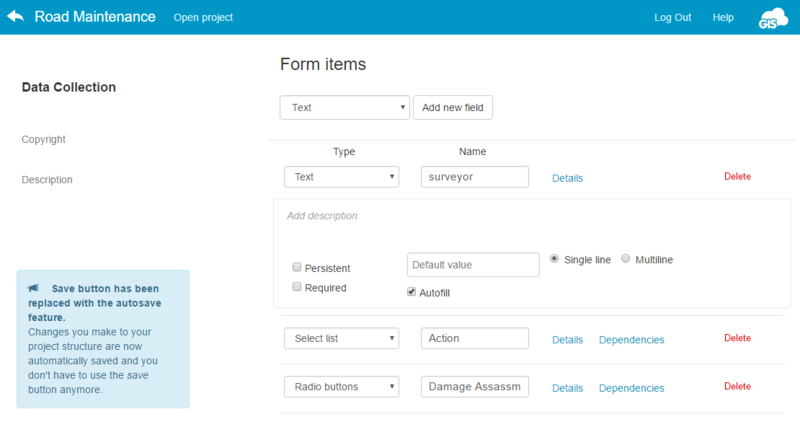 If the project is empty, click on Autofill will return null value, but if there are some points in the project autofill will return name of the surveyor from the nearest point. In Map Editor it is possible to set Autofill to fetch attribute data from any layer in the map. Example: we’ve collected data about roads. A new point layer is created and we would like to want to inspect road data, but use previously collected road ID and road name. Create a new form or open an existing one in Forms Manager. In Source layer box enter ID of the layer from which data will be fetched. Note: layer ID can be found in Layer list. Place the cursor above layer name and ID will appear. In Result box enter the name of the field from the source layer you want to fetch data from. Note: be sure to add a column name, not label. You can check the name in Layer properties, under Attributes tab. Open the map and layer in MDC on your mobile device. Select a location using GPS or Pinpoint. In the form tap Autofill.